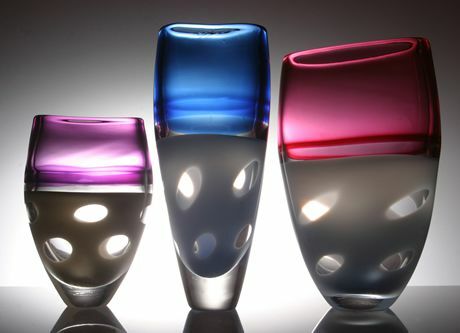 Profile: Stuart Akroyd studied glass design at Sunderland Polytechnic and gained his mastery of the art at the International Glass School at Brierly Hill in the West Midlands. The current range of Stuarts work is inspired by the natural forms and rich colours found in the world’s oceans.Each piece is first blown and shaped by hand until the exact shape is achieved. The glassware is then slowly cooled to prevent cracking. The cold glass is then ground and polished to a brilliant finish to reveal a window into the well of coloured glass. Of course each piece is unique in itself and when possible inscribed by the artist.